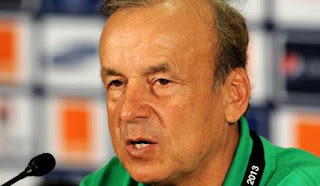 Head coach of the Super Eagles, Gernot Rohr, has admitted that he does not have a world-class goalkeeper in his squad. Nigeria secured a Russia 2018 ticket on Saturday, with a 1-0 win over Zambia in Uyo, with Ikechukwu Ezenwa in goal. Ezenwa has conceded only one goal in his last three games for the Eagles. “I don’t have a world class goalkeeper now but we’ll go with what we have. “Ezenwa is progressing so much that in the past few weeks he is becoming a very good goalkeeper and that is why he kept in the games against Cameroon and Zambia. He is a goalkeeper much stronger than before, we shall have to see what will happen in the next few months. “It is a very important position for any team. For the moment, we are very happy about the performance of Ezenwa. He has suddenly become an important member of the squad and we would keep working on him and see how how it goes,” Rohr told Complete Sports.